Progressive multifocal leukoencephalopathy (PML) is a rare but devastating disease in acquired immuno deficiency syndrome (AIDS) patients. PML in HIV/AIDS is rare in India and literature is limited. We are reporting a case of probable AIDS-related PML from Antiretroviral Therapy (ART) Centre Jabalpur. It was our first case of PML (possible) in 3194 registered HIV patients taking ART since 2006. Progressive multifocal leukoencephalopathy (PML) is a rare, serious, and usually fatal demyelinating disease caused by human polyomavirus (JCV). The incidence of this opportunistic infection has risen dramatically during the AIDS epidemic. PML is the result of reactivation of latent JC virus infection in the setting of cellular immunodeficiencies. Cases associated with HIV account for 85% of all cases. PML is the only known clinical manifestation of JC virus infection. This disease has been diagnosed in 2%–4% of HIV-infected patients in developed countries in the pre–highly active antiretroviral therapy (HAART) era.,, The incidence of PML has decreased less dramatically when compared to other central nervous system (CNS) diseases in the HAART era., PML has rarely been reported in HIV-infected patients from developing countries in general, and India in particular., The clinical entity of PML is to be suspected in HIV-infected patients who present with focal neurologic deficits. To the best of our knowledge, PML as a presenting manifestation of AIDS is very rarely reported from Indian literature. A 40-year-old male was admitted in medical ward with a history of subacute-onset weakness of left half of body and deviation of mouth to the right side for 3 weeks. There was no history of sensory loss. There was no history of seizures, fever, vomiting, headache, head injury, jaundice, and ear discharge. There was no history of any prior medical illness. He was a smoker and a social drinker. He was married and had three children. On examination, the patient was afebrile, pulse was 86/min, blood pressure was 100/70 mmHg and respiratory rate was 16/min. He was conscious, oriented, and pupils were bilaterally equal and reacting to light. There was left-sided hemiparesis grade 3/5 and upper motor neuron type of seventh cranial nerve palsy on the left side. Rest of the examination was normal. The laboratory investigation after admission showed normal hemogram and biochemistry. Cerebrospinal fluid (CSF) analysis revealed normal biochemistry. CSF cytology demonstrated 10 cells, all lymphocytes. CSF was venereal disease research laboratory nonreactive as well as negative for cryptococcal infection. CSF was also found negative for tubercular antigen by polymerase chain reaction. MRI brain revealed large confluent T2 hyperintensity involving right high frontoparietal white matter, right temporal white matter, and left frontal white matter. Lesions were hypointense on T1-weighted images [Figure 1]. ELISA for HIV-1 was positive. Absolute CD4 count was 120/μL. Facilities of polymerase chain reaction (PCR) for JC virus in CSF were not available. In view of above clinical features and investigations, the patient was diagnosed to have AIDS-related possible PML. The patient was started on HAART along with prophylaxis of opportunistic infections, but he died after 1 month. Since the onset of AIDS epidemic in 1981, the incidence of PML has increased significantly and now HIV-associated cases account for up to 85% of all cases of PML., PML has been estimated to affect 4% of patients with HIV infection. India has over 5 million people living with HIV/AIDS at present. The expected incidence of PML in Indian HIV-infected population should be significantly large. However, PML is uncommon in India. There is sparse literature on HIV/AIDS with PML from developing countries including India., In the study from All India Institute of Medical Sciences, Delhi, 1.2% of the patients attending the ART clinic had PML. It is less common compared to developed countries, where it has been reported in up to 5% of patients. Literature from India includes small series and case reports. Three cases have been reported from a tertiary care center in southern India. The non-AIDS population affected by PML is middle-aged and usually harbors either an underlying lymphoproliferative, myeloproliferative, granulomatous disorder or is receiving immunosuppressive therapy. The neurologic signs and symptoms of PML result from the viral destruction of the myelin-producing oligodendrocytes in the CNS. The main pathologic features are atypical astrocytes with enlarged multilobulated nuclei and intranuclear inclusion in oligodendrocytes which are JC virus particles on in situ hybridization. The clinical features are of progressive focal neurological dysfunction. Commonly aphasia/dysarthria, monoparesis, hemiparesis, ataxia, cortical blindness, or visual field defects are reported. Mental status changes such as confusion, dementia, and even coma are seen. Seizures are infrequent (<10%). There are no clinical features of raised intracranial pressure or of systemic infection. Possible with the presence of typical clinical and radiological picture but no demonstration of JCV infection. One can consider three “stages” to the diagnosis of PML: Clinical suspicion, radiological identification, and etiological confirmation by CSF or tissue analysis. The first of these relies on the character and temporal evolution of focal neurological symptoms and signs as outlined above, along with the setting of disease susceptibility. The second stage in diagnosis entails detection and characterization of brain lesions by neuroimaging, preferably magnetic resonance imaging (MRI). MRI shows characteristic white matter lesions in brain areas corresponding to the clinical deficits. 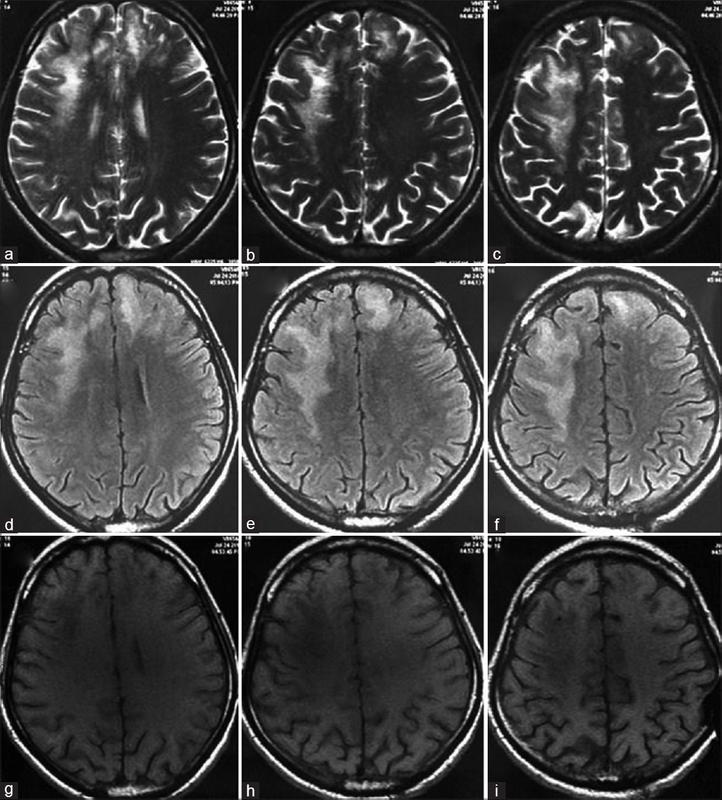 Because lesions involve demyelination, they are not only hyperintense on T2-weighted and fluid attenuation inversion recovery MRI sequences but also hypointense on T1-weighted sequences, indicating white matter destruction. The later helps distinguish PML from other pathologies, primarily HIV-1 encephalopathy, with more diffuse central white matter changes that are not detected on T1 sequences. While lesions can develop in any part of the brain, including the deep grey matter, they are most common in the subcortical white matter, the white matter of the cerebellar peduncles or hemispheres and in the brain stem. In the classical, noninflammatory form, there is either no or only minimal contrast-enhancement, and no mass effect, unlike cerebral toxoplasmosis and primary CNS lymphoma. Etiological diagnosis of PML usually relies first on the detection of JCV DNA in CSF by PCR. Among HIV-1-infected, combined ART untreated patients with neurological diseases; the diagnostic sensitivity of this technique was of 72%–92% and specificity of 92%–100%. Thus, a positive result is regarded as diagnostic in the appropriate clinical context. Because the rate of JCV DNA detection increases with progression of PML, lumbar puncture is usually repeated if the initial PCR analysis is negative, but suspicion remains high. When efforts to detect JCV DNA in the CSF fails, brain biopsy is required to achieve an etiological diagnosis of PML. Berger JR, Kaszovitz B, Post MJ, Dickinson G. Progressive multifocal leukoencephalopathy associated with human immunodeficiency virus infection. A review of the literature with a report of sixteen cases. Ann Intern Med 1987;107:78-87. Petito CK, Cho ES, Lemann W, Navia BA, Price RW. Neuropathology of acquired immunodeficiency syndrome (AIDS): An autopsy review. J Neuropathol Exp Neurol 1986;45:635-46. Dworkin MS, Wan PC, Hanson DL, Jones JL. Progressive multifocal leukoencephalopathy: Improved survival of human immunodeficiency virus-infected patients in the protease inhibitor era. J Infect Dis 1999;180:621-5.
d'Arminio Monforte A, Cinque P, Mocroft A, Goebel FD, Antunes F, Katlama C, et al. Changing incidence of central nervous system diseases in the EuroSIDA cohort. Ann Neurol 2004;55:320-8. Sacktor N. The epidemiology of human immunodeficiency virus-associated neurological disease in the era of highly active antiretroviral therapy. J Neurovirol 2002;8 Suppl 2:115-21. Vidal JE, Penalva de Oliveira AC, Fink MC, Pannuti CS, Trujillo JR. Aids-related progressive multifocal leukoencephalopathy: A retrospective study in a referral center in São Paulo, brazil. Rev Inst Med Trop Sao Paulo 2008;50:209-12. Shankar SK, Mahadevan A, Satishchandra P, Kumar RU, Yasha TC, Santosh V, et al. Neuropathology of HIV/AIDS with an overview of the Indian scene. Indian J Med Res 2005;121:468-88. Manji H, Miller RF. Progressive multifocal leucoencephalopathy: Progress in the AIDS era. J Neurol Neurosurg Psychiatry 2000;69:569-71. Hoffmann C, Horst HA, Albrecht H, Schlote W. Progressive multifocal leucoencephalopathy with unusual inflammatory response during antiretroviral treatment. J Neurol Neurosurg Psychiatry 2003;74:1142-4. Hurley RA, Ernst T, Khalili K, Del Valle L, Simone IL, Taber KH, et al. Identification of HIV-associated progressive multifocal leukoencephalopathy: Magnetic resonance imaging and spectroscopy. J Neuropsychiatry Clin Neurosci 2003;15:1-6. Sharma SK, Soneja M, Ranjan S, Miglani S, Hari S, Sinha S, et al. Progressive multifocal leucoencephalopathy in HIV/AIDS: Observational study from a tertiary care centre in Northern India. Indian J Med Res 2013;138:72-7. Berger JR, Major EO. Progressive multifocal leukoencephalopathy. Semin Neurol 1999;19:193-200. Shankar SK, Satishchandra P, Mahadevan A, Yasha TC, Nagaraja D, Taly AB, et al. Low prevalence of progressive multifocal leukoencephalopathy in India and Africa: Is there a biological explanation? J Neurovirol 2003;9 Suppl 1:59-67. Cinque P, Koralnik IJ, Clifford DB. The evolving face of human immunodeficiency virus-related progressive multifocal leukoencephalopathy: Defining a consensus terminology. J Neurovirol 2003;9 Suppl 1:88-92. Cinque P, Koralnik IJ, Gerevini S, Miro JM, Price RW. Progressive multifocal leukoencephalopathy in HIV-1 infection. Lancet Infect Dis 2009;9:625-36. Cinque P, Scarpellini P, Vago L, Linde A, Lazzarin A. Diagnosis of central nervous system complications in HIV-infected patients: Cerebrospinal fluid analysis by the polymerase chain reaction. AIDS 1997;11:1-7. Yoganathan K, Brown D, Yoganathan K. Remission of progressive multifocal leukoencephalopathy following highly active antiretroviral therapy in a man with AIDS. Int J Gen Med 2012;5:331-4. Khanna N, Elzi L, Mueller NJ, Garzoni C, Cavassini M, Fux CA, et al. Incidence and outcome of progressive multifocal leukoencephalopathy over 20 years of the Swiss HIV Cohort Study. Clin Infect Dis 2009;48:1459-66.